CHFJPY has halted its more than 2- week of uptrend and jumped more than 200 pips from low of 109.88. The decline was mainly due to broad based selling in US dollar against all majors especially against CHF and JPY. Markets eyes SNB monetary policy meeting which is to be happened today for further direction. It is currently trading around 111.18. The near term minor support is around 111.30 and any break below will take the pair to next level till 111 (200-H MA)/110.68 (61.8% fib). Major trend reversal only above 112.20 and it should cross above this level for jump till 112.73/113.Minor resistance is around 111.75. 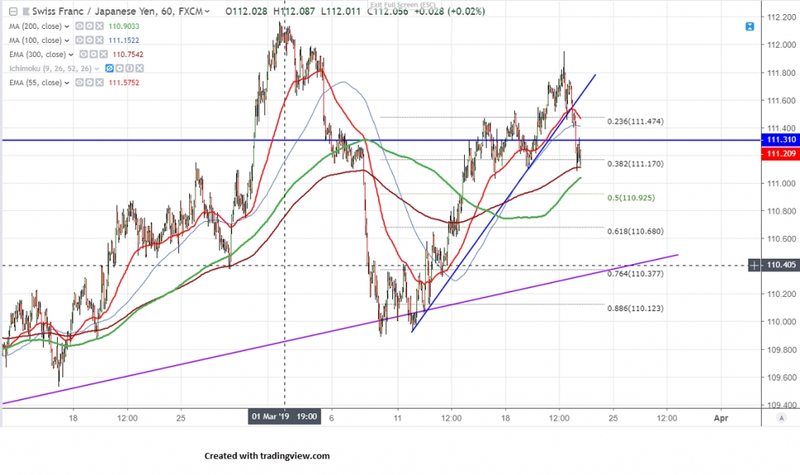 It is good to sell on rallies around 111.55-60 with SL around 112 for the TP of 110.68/110.